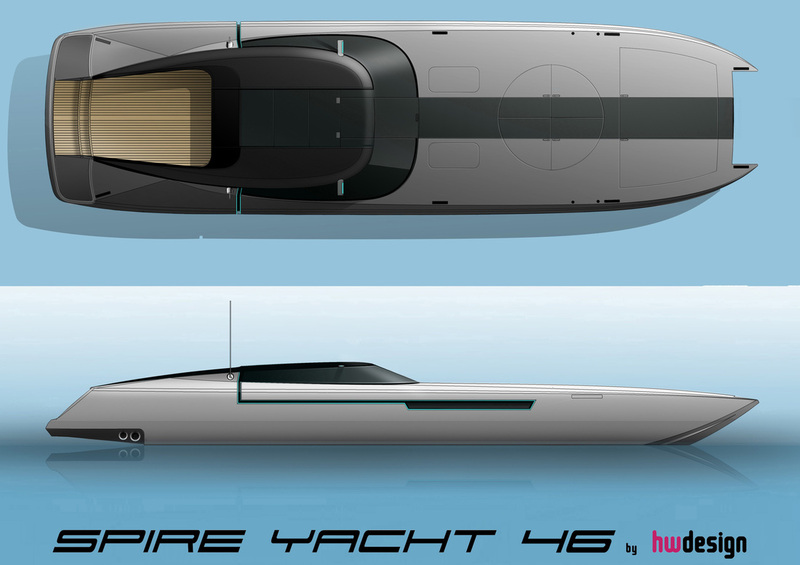 With several luxury powerboat models and tenders already under their belt, SPIRE BOAT has now collaborated with Henry Ward Design to conceive this ambitious 46ft luxury speed yacht / chase boat named the SPIRE YACHT 46. The lines of this craft are pure and elegant and with a great combination of day and night LED lights the Spire Yacht is bound to make an impression wherever it goes. 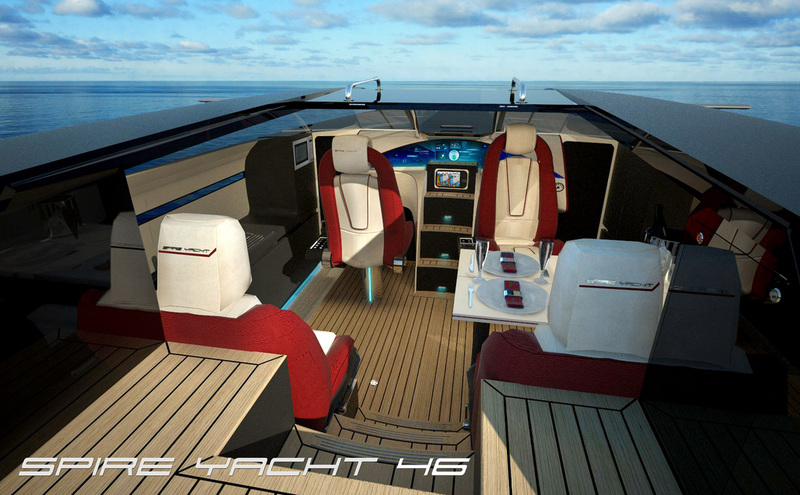 The vessel oozes luxury and boasts 3 double cabins, including an owner’s cabin with private facilities. 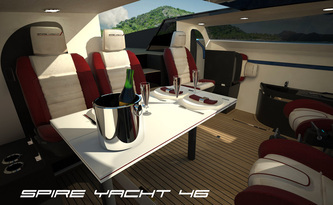 The comfortable seats in the main saloon give great support while on the move and create a sociable room while at rest as the helm seats swivel around two removable dining tables. There is also an optional pull-out single bed here for the captain if required. Aft of the saloon there is a second communal toilet and a shower cabin (with standing head room). To port is a galley with electric BBQ, polished stainless steel sink, fridge and microwave oven whilst the starboard unit features one of the three on board LCD TVs. Pure music can also be heard around the yacht when controlled from any of the iPod docking ports. 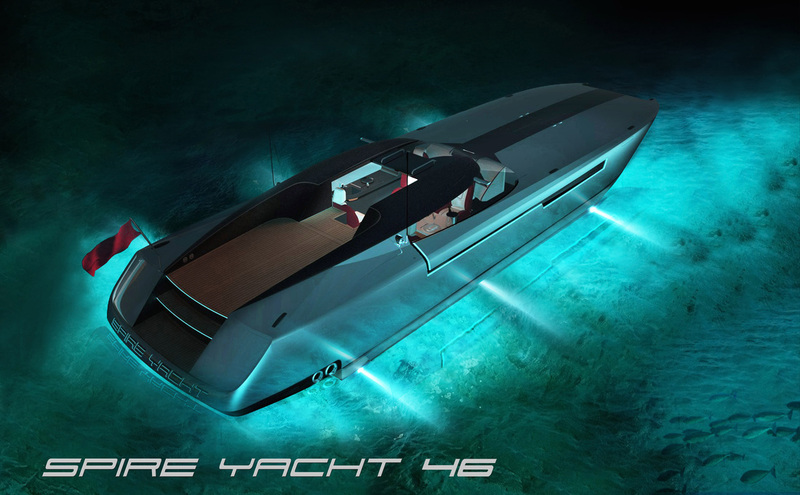 Accessed via a gull-wing door in the front screen, the yacht also boasts a spacious sunbathing area on the foredeck with a diving board and the option of an overflowing sea water spa encrusted with 240 carats of diamonds. More recreational space is also offered on the aft deck with sunbed cushions available for over the engine hatches and a swim ladder for easy water access. An optional table can also be fixed here for alfresco dining. The SPIRE YACHT 46 has been developed and designed using the most advanced 3D CAD software to take advantage of CAM tooling manufacturing process. All aspects of the vessel, including the hydrodynamics, aerodynamics, aesthetics, ergonomics, acceleration, power and performance have been optimised. Considerations of SPEED have been at the forefront of the design process. 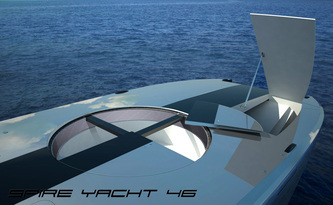 The amazing catamaran hull allows guests to cruise at 65 knots (75 mph) with a very low consumption of fuel (approx. 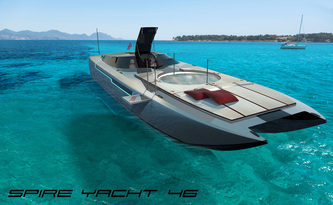 350 litres per hour at this cruise speed). 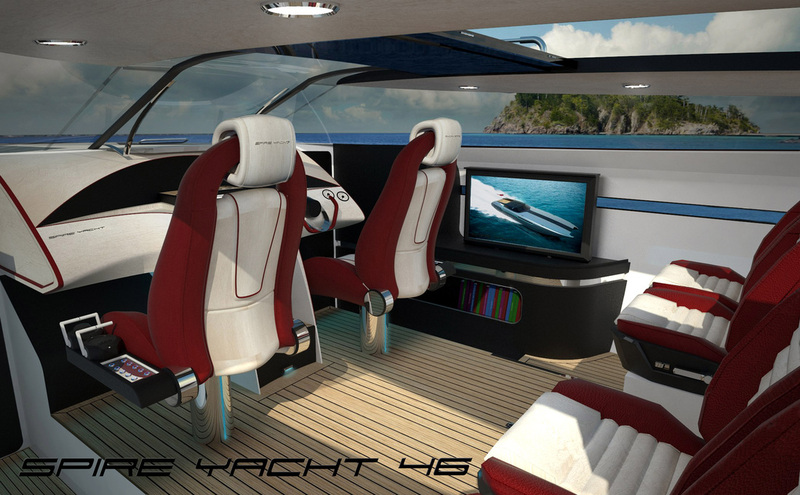 All the engine parts, drives and propellers are chosen from the MERCURY range for viability and world maintenance while propelling the yacht to a top speed of 90 knots (105 mph). The futuristic helm console had been ergonomically designed with a large wrap around screen that displays important running information. 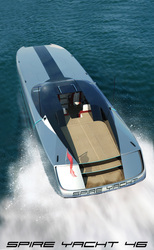 When it’s time to stop however, the custom self-launching anchor system makes mooring easy.